Is the Wagner Flexio 590 Sprayer Right for me? Looking for an unbiased review of the Wagner FLEXiO 590 Paint Sprayer? We take a close look at the paint sprayer everyone is talking about. The Wagner 590 paint sprayer kit handles even the thicker paint types (like latex) with ease. It's one of the most powerful sprayers around, and can really help speed up large spraying projects. It may look like your average sprayer gun, but it incorporates new patented technologies that give it a level of performance that is impressive when set against its competitors. In this review, we’ll discuss the key features, uncover its true performance, and give our opinion on who it’s best suited for and why. We like this spray gun very much, it’s just not for everyone. Let’s take a look at the FLEXiO 590 in more detail. How well does it deliver the paint? It can't all be good right? Suitable for both indoor and outdoor painting this handheld spray gun kit is both powerful and flexible. A big selling point is Wagner’s commitment to the motor efficiency. 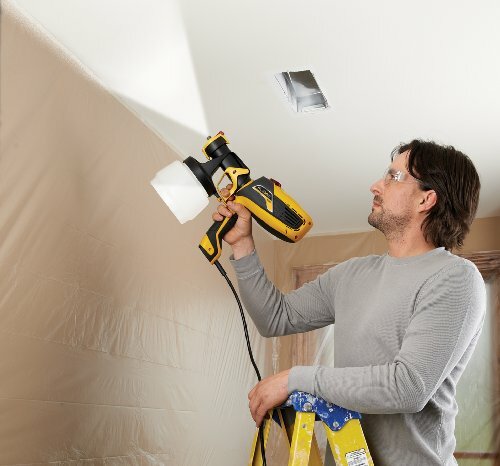 The 590 is likely both quieter and lighter than any spray gun you’ve used in the past. Weighing in at just 4.0 lbs and putting out just 65 dB of noise (at low settings) it packs some impressive engineering. So what sets the FLEXiO paint sprayer apart from other models? Performance-wise it is aided by a new patent for Wagner. The X-Boost Power Dial is unique to the FLEXiO range and offers painting speed and coverage that’s hard to match. The technology automatically adjusts the air pressure produced by the turbine motor so that you have complete control over any coating. By keeping the air pressure high, the sprayer will drop less material and the finish will be noticeably smoother. This is especially important for thicker paints that require more turbine strength. The Power Dial comes with 9-settings to give you the ultimate in painting control. This feature improves coverage by improving the airflow of the gun. By improving the turbine efficiency this Wagner FLEXiO paint sprayer is able to deliver more power and increase the airflow delivery. This results in smoother finishes with less material being wasted. The suitable for all spraying situations. It's perfect for exterior surfaces, interior walls, and also fine finishing (using the special detail nozzle). 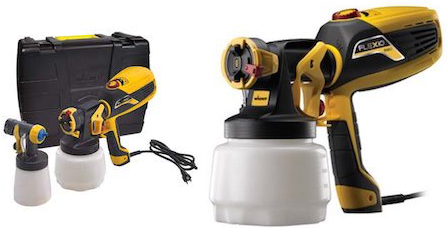 It comes with 2 nozzles to meet the demands of the most challenging painting operations. iSpray nozzle - suited best to unthinned paint and wide surface areas. This nozzle is for general coverage where you don't need to be too careful. Detail finish nozzle - for the fine finishes and tricky sections. Includes vertical, round, and horizontal pattern positions. Thanks to the adjustable control, you can spray unthinned coatings. And most importantly, it offers full coverage and low overspray to make your painting projects easier and enjoyable. This makes the Wagner 590 sprayer one of the most popular Wagner paint products on the market. It's able to produce up to 8 gallons per hour of material which is as much as three times quicker than some conventional paint sprayers. It has adjustable paint flow settings so you can match the paint delivery to your coverage speed and project size. Sadly, no this Wagner FLEXiO 590 review is not perfect. A major bone of contention for us was the learning curve. This is not the paint gun for beginners. Its variety of settings will leave the inexperienced user feeling confused and there's a high likelihood that they'll experience some overspray in the beginning due to its power. There's also a rather complicated screwing system to detach the container from the gun. It's not exactly intuitive and you'll probably need to consult the manual to crack it. It definitely takes a bit of practice to master the Wagner 590. Still got questions? Hopefully, you'll find the answer down below. If not leave us a message and we'll get back to you as soon as possible. 1. What's the difference between Wagner Flexio 570 and 590 Sprayer? The 590 has an adjustable dial for additional speeds, however, the 570 has just two-speed settings. The also 590 sprays more gallons per minute and come with a 2nd nozzle for a more detailed finish. 2. Will this spray latex primer? Yes, it will spray latex primer and you don’t have to thin it at all, as most users have had a good experience when using latex. All you need to do is turn up the dial and you don’t need to thin. 3. Can it use exterior latex paint? Yes, you can use any oil or latex based paint, primer, or stain. However, you will need to do a long winded cleaning if you want to maintain it in good working condition. 4. Would this be good to paint a house? It would be a great time-saver when compared to most other guns due to its power delivery. You can get a nice wide spray for large surfaces and also a professional finish and look. 5. What are some common troubleshooting tips? If the sprayer doesn't produce any pressure in the container you have to tighten it because it is probably loose. 6. Are replacement parts readily available? Yes, the majority of the parts for the 590 are easily available. Most of the parts are available online from sites like Amazon or you can e-mail Wagner themselves for an official list of suppliers. 7. Is it easy to clean? Yes, maintenance-wise the FLEXiO 590 sprayer is pretty easy to look after. It comes with a cleaning brush and the parts are easily separated when cleaning time comes around. 8. Can it be used to paint a ceiling? The only problem here is that it mustn't be tilted more than 45 degrees. This is because the paint may enter into the fan mechanism and ruin your device. This poses a risk but it's still possible to paint ceilings due to the adaptable spray modes. In our opinion, the Wagner 590 paint sprayer is definitely worth the extra money it retails for....but....only if you are an experienced paint sprayer that needs something with faster paint coverage. Its multitude of settings and customization options put it out of reach of the beginner or first time user, but for those with the "know how" this gun is a worthwhile investment. The FLEXiO 590 gives you the ability to paint whole walls in no time at all and increase your efficiency like never before. It's also delicate enough for detailed finished and the two nozzle system works a dream. No, it's not cheap but if you're a regular user of paint sprayers then it's a worthy investment as you'll get more done, faster. In conclusion, the Wagner FLEXiO 590 reviews very positively, just not for everybody. We hope you've found our latest review useful and we hope to see you back at SprayerGuide.com soon as we have lots more coming over the coming weeks and months. Don't forget to join our mailing list to never miss a review or guide here. Just add your e-mail address in the box in the top right of the page. I promise it will only take a second. Check out more Wagner paint sprayer reviews here.